The Road To Mt Whitney is.....Under Construction? While engrossed in writing a scintillating post about crampons and ice axes, two releases from the Inyo National Forest roll across my eyeballs. The first one is an overview of the 2016 reconstruction project for Whitney Portal Road. For the uninitiated, Whitney Portal Road is the one route for vehicle access to the Portal, which is the location of the Mount Whitney Main Trial and North Fork (Mountaineer's) Route trailheads. The second is a nuts-and-bolts PDF regarding how to make your Mt Whitney Quest work. So both are required reading for any trip into the Portal area, including car and RV camping, hikes to Meysan Lake, Mt Muir, the backside of Lone Pine Peak, excursions to Mt Mallory, Mt Irvine, and the rest of the area's lumps, bumps, and puddles. Now a third document is available complete with maps and diagrams showing where roadside parking will be prohibited plus the designated parking areas for permit holders. This new document also shows construction will be split into three phases. Phase 1 will be closest to the Portal. As the work moves downward (eastward) back towards town, roadside parking restrictions will ease somewhat in the Portal area. Read the document for more information. Mt Whitney permit holders will receive all priority regarding parking. However, permit holders are not guaranteed a space. The Forest Service really really recommends parking the car at a lot in Lone Pine and utilizing any one of the many shuttle services to get to the trailhead. Also, anyone hoping to stage a car for a John Muir Trail hike or a Whitney climb from Horseshoe Meadows, Onion Valley or the High Sierra Trail will find themselves shut out. So the road construction's impact goes way beyond anyone's Whitney aspirations. However, it does appear reserving a Whitney Portal car camping area site for our "base camp" may get us around the heavily restricted parking situation caused by the construction. Every campsite allows parking for two vehicles. Start your climb from your campsite by following the last bit of the Whitney Portal National Recreation Trail to the Main Trail proper due to parking restrictions. We should be staying up high anyway before climbing even higher. I'm not going to regurgitate the entirety of the four releases. 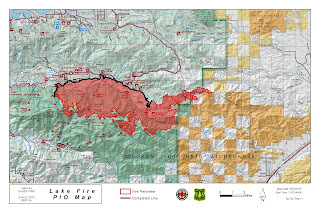 Just click on the links above and get the info straight from the Forest Service. Reading between the lines, the single day parking permit is good for the climb date from midnight to 11:59 pm. The day use parking opens every morning at 8:00 am and closes every night at 8:00 pm during construction. People recreating in the Portal area or visiting the Portal Store, or perhaps taking a stroll to Lone Pine Lake should use this lot. Towing will be strictly enforced outside the hours outlined above so this lot is not suitable for summit day. Another layer of uncertainty for "Walk-Ins"
"Walk-in" permits, those fortunate few taking advantage of returned unused lottery permits by being in the right place at the right time, may be discontinued for the 2016 season entirely, if the construction situation becomes untenable. At any rate, all "walk-in" permit climbers will be required to use a shuttle for trips to the trailhead. Seems to me the Forest Service hasn't made up their mind yet but I wouldn't plan on dive-bombing your Mt Whitney plans this year. Even if you do get one, it's a messy situation. Here's a thought: Start your trip from Lone Pine Camp and use the Recreation Trail. There are a few extra spaces for your car. Doing so will add four miles and 2,400 feet of vertical change each way. Can you do almost 30 miles and 8,500 vertical feet in a day? How much different will it be for the multi-day climber? It might mean staying at Outpost Camp instead of Trail Camp. Do that anyway because it means an easier night's rest. Questions? Drop 'em in the comments section. If I can't answer them, I'll find someone who can. For this Whitney summer season, let's all heed the request by the USFS and "Please pack your patience." Just took a look at remaining Mt Whitney availabilities. As of August 2, 2015, 44 people can still sign up for a single-day climb on Thursday, October 1. While the weekends are still booked solid, early October has tons of weekday availabilities. However, the weather can be extremely changeable. Any precipitation will be frozen above 9,000 feet or so. Having said that, bluebird days are not unknown in October so there's potential for beautifully clear, cool conditions as well. Extra clothing and proper footwear are a must, just in case. To check availabilities, go to recreation.gov. Enter "Mt Whitney" in the search box. Choose 'Day Use" under "Permits and Wilderness" Hit "Enter Date" on the next screen. In the "Permit Availability" box enter a date and group size. Don't be too fine with the date. Once in, you can slide the calender in two week increments either way. If October 1 doesn't float your boat, keep checking back and refreshing the screen occasionally. Someone might return all or part of their permit more than 48 hours before their climb date, thereby creating a possibility for an earlier slot. Be ready to pounce, though. Others are lurking over the permit calender as well. That open slot might close in a few minutes. As for multi-day trips up the Main Trail, the earliest opening is currently mid-October. However, the same basic rules apply so check often for an earlier opportunity. Don't forget to reserve space at Whitney Portal for some pre-climb acclimation and post-climb slumber. Breaking news: As of July 16, 2015, Forsee Creek, San Bernardino Peak, Momyer, and Vivian Creek trails are now OPEN. 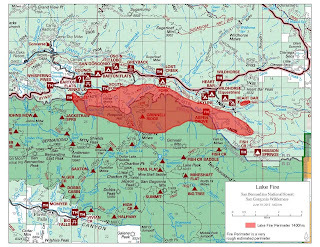 Any trail or road in the burn area (see last burn map marked "July 6" below) remains closed. Hike 10 (San Gorgonio via Vivian Creek Trail) and 11 (San Bernardino Peak out of Angelus Oaks) of the Mt Whitney Dirty Dozen are now available. Please stay out of the burn areas and be watchful for firefighters and apparatus on the roads. Heavy fines levied for individuals or groups who do not heed the closures. 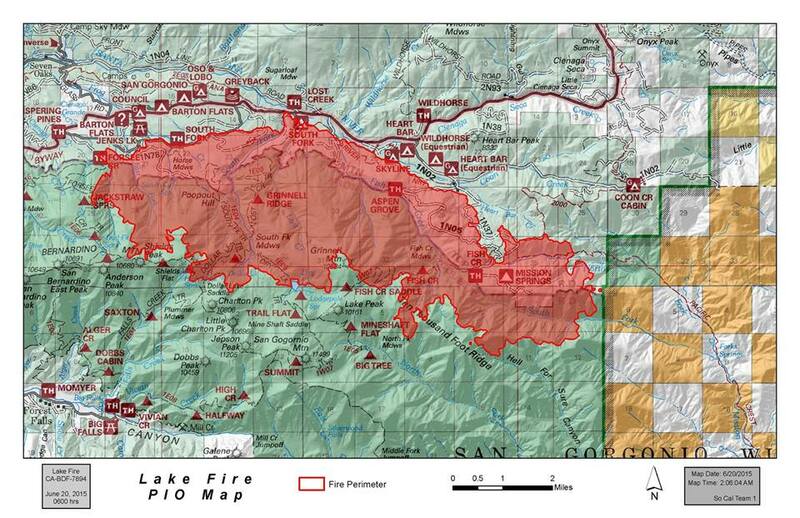 The Lake Fire still smolders in some places but has moved into recovery phase. More information about recovery and the aftermath along with photos of the burn area can be found here. 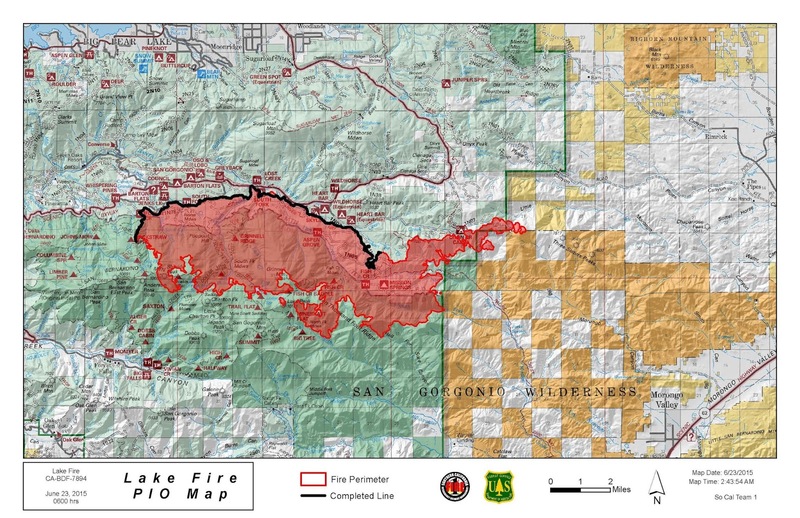 Those of us based in Southern California are following the sad news regarding the Lake Fire. 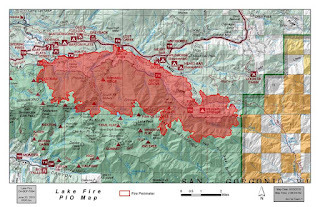 To date, the fire has now stalled at 31,359 acres of pine forest, understory, and an iconic aspen grove in the Fish Creek area. The fire is now relegated to smoldering in some areas. There is some chance of mud flows in heavily burned areas. 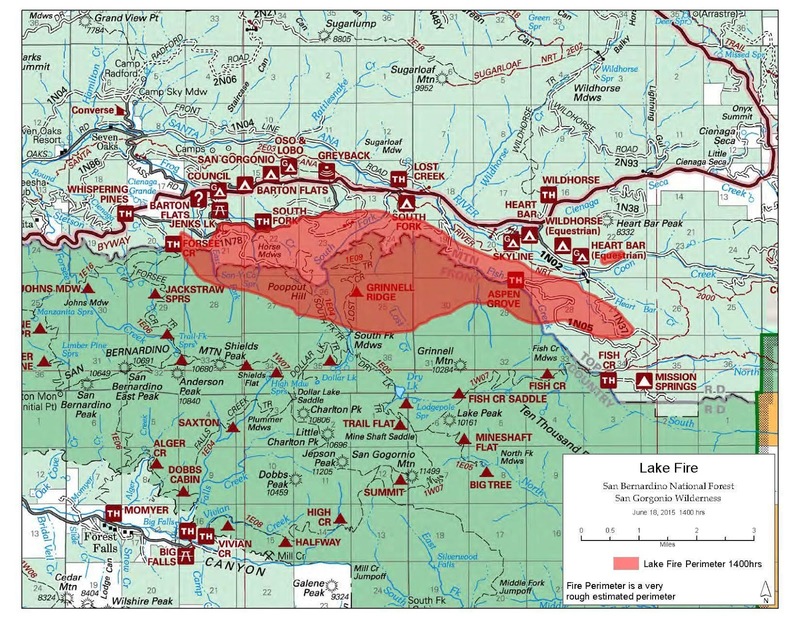 Hazardous conditions remain due to smoldering, stump holes, and other unstable ground. Cause of the fire deemed "human activity" by USFS investigators. However, no one can say for sure whether that activity was intentional or an accident. For prospective Mt Whitney climbers, Hikes 10 and 11 of the Mt Whitney Dirty Dozen are now officially closed until at least October 1, 2015. See closure map near the end with training alternatives..
June 20. Note the relative positions of the Vivian Creek and San Bernardino Peak trails to the burn area. June 23. 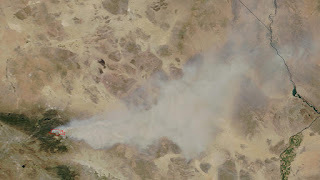 The bold black line at the top of the burn is the containment line. More than 50 percent of the South Fork route to San Gorgonio is gone. The Vivian Creek route (hike 10) straddles the south slope of San Gorgonio while the fire blackened the north side pretty much up to the treeline. 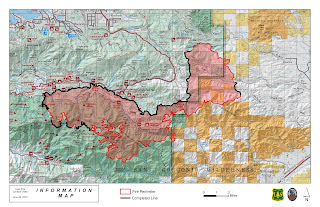 The fire did not effect the trail directly but the most recent map showed the flames jumping the ridge and burning east of the Vivian Creek trail. The San Bernardino Peak route out of Angelus Oaks (Hike 11) lies farther to the west and completely unaffected as the flames spread east and south from the origin point near a summer camp off Jenks Lake Road. 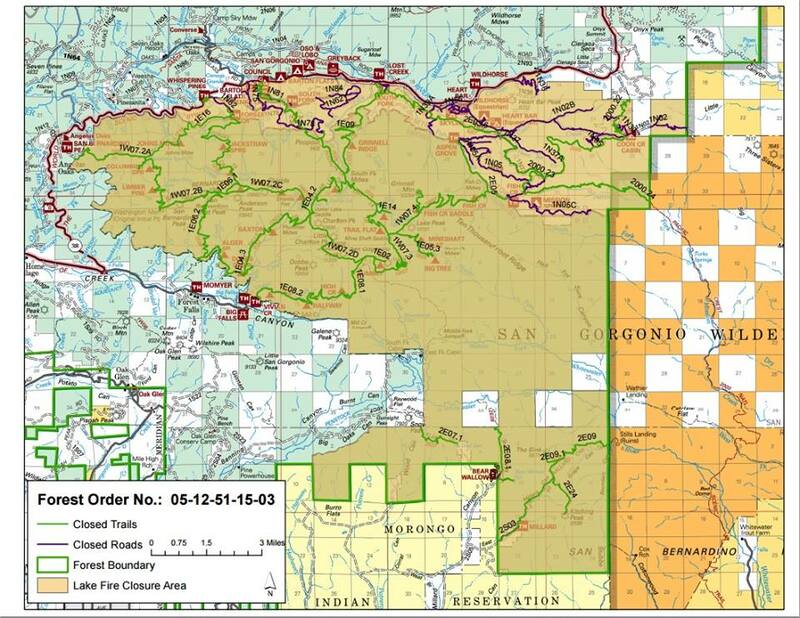 All trail routes through the San Gorgonio Wilderness are closed (CA Route 38, the trailhead access route, has been reopened). Closures will be in effect until at least October 1, 2015. If you want to complete your Dirty Dozen training, there is an alternative: Climbing San Jacinto via the old pre-tramway route from the west side. The town of Idyllwild is the jump-off area. Heading out via Humber Park or Deer Springs trailhead will result in climbs of about 17 miles round trip (though Harrison maps show them as longer) while gaining about 5,600 vertical feet. Both trailheads are good stiff tests that will augment your stamina buildup and leave you in good stead for your date with Mt Whitney. However, the loss of 800 vertical feet from San Gorgonio's 11,503 elevation means your immediate pre-Whitney acclimation routine for single-day or multi-day climbs will be even more important. Start your climb early, as the lower elevations near town will heat up as the sun rises and swings over to the western slopes. Mt Lukens, aka Sister Elsie Peak is the highest point within Los Angeles city limits at 5,075 feet (1,547 m). It's not a particularly tall mountain, nor is it a pretty climb. The city flattened the summit area to make more room for antennas and haze often obscures the view. So why are we climbing it? There are two reasons. First would be bagging the highest point in LA. However, we're climbing it because it rises 800 feet per mile for four miles without much altitude effect. It's a great early step for those training with higher aspirations. If this hike leaves your legs quivering, you have a lot of work to do before you're Whitney-ready. There are two principal routes. A fire road climbs out of Deukmejian Wilderness Park in Glendale. This route is boring, dusty, and incendiary as it climbs the south-facing slope. Our route is mostly single-track ascending the peak's north side. People lose the thread after crossing Big Tujunga Creek so follow along with our photo-gravure as we decipher the clues to a day filled with sun, sweat, and satisfaction for your hard work. The road descends and lands at a T-intersection facing the sign. Turn right toward Vogel Flat. The day we shot the pics, this roadblock barred our way. Erected by an in-holding homeowner, she emerged from the house and asked our business when we stopped and parked. When assured we did not mean to drink, carouse, and/or debauch, she cheerfully took the roadblock down but followed us as we made our way on foot to the trailhead. The road is a public right-of-way and the homeowner does not have the right to block it. However, let's all play nice and avoid entering into a heated debate about who has the God-given right to do what. After all, you're leaving your car behind for a few hours. It's another 330 yards (300 m) to the trailhead from here. If the block isn't up, park your car at the end of the road. Note the trailhead on the berm to the left of the "END" sign. Once over the berm, continue along what used to be Stonyvale Road before a bygone flood washed it out. Big Tujunga Creek runs to your left. The view to the south from the trail. Note the dirt tracks. This land may or may not be private down to the streambed running left to right through the middle of the photo. Treat everything off the road or trail up to this point as private and respect it. Once past these girders, everything is public. just past the girders you'll find a small rockfall. Look south-southwest from the rockfall and find this dead tree. Note the trail to the left of it partially obscured by the chaparral and the foliage from the creek. That dead tree is on the left side of this stony drainage from which Stone Canyon gets it's name. Keep going to the northwest away from the dead tree. A closer view of the river rock. The trail runs up the left side following the rift. You're still walking northwest while the canyon rises to the south. When aligned with the center-right of the canyon from your perspective, start looking for the path to the creekbed as seen below. Follow to the creek. This year (early April 2015), Big Tujunga Creek is a simple rock hop. As recently as 2010, it has been a raging torrent at certain times of the year. Do not cross unless it's safe. You may have to choose an alternate place to cross. If you have any doubts, call it a day or climb nearby Condor Peak instead. Once across, clamber up this bank and watch for the trail bending left. The dead tree from the trail east of it. you can see the trail now. If you see the stanchion from the old trail registry, you're on the right track. The trail hangs a 90-degree right and starts climbing. Up the trail a bit, looking back the way you came. Find the little rock fall on the left-right trail beneath the rock cut where you first spied the dead tree. To the northwest is the Wildwood Picnic Area parking lot. Looks temptingly close. It won't seem so close if the NFS decides to lock the gate. Keep heading straight up-canyon while keeping your eyes peeled to the left. The trail will leave the canyon, sweep left, and start switchbacking up a rib. The grade does not relent until you reach a small plain below the summit mound. At that point, follow the fire road heading towards the antennas. Start this one early. A hat, sunscreen, and at least three liters of water are a must. 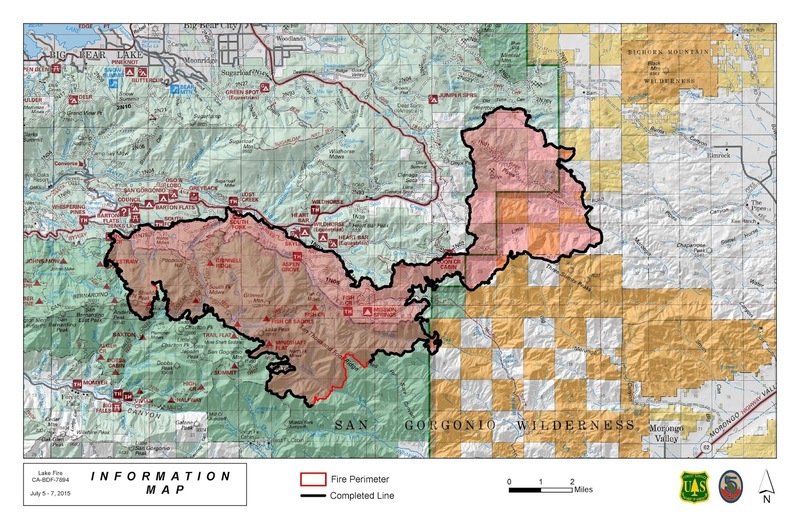 The entire area except the summit plain burned in the 2009 Station Fire. The trail was closed for two years. Maybe a foot of shade exists on the whole trail now. Poison oak abounds all along the route so identify it and do your best to avoid it. An immediate hot soapy shower and clothes wash will prevent a breakout. Load the washer first, then shower in case your clothes have the oily residue on them. There are many areas overgrown with new scrub oak and chaparral on the trail's upper third. Climbers must contend with a few washouts as well. Use your very best judgement on this climb. However, if anything I've written thus far dissuades you from from attempting it, then your Mt Whitney aspirations may be wobbly as well. This is an early test of your mental commitment and your physical conditioning. Just remember you're entering a national forest, not an amusement park. Be aware at all times. Take pride in this early victory. Build from it. Please like Mt Whitney Quest on Facebook. 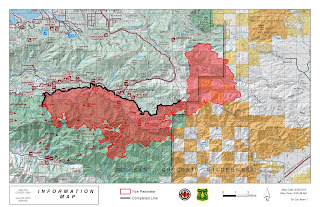 The map on the floor of the Eastern Sierra Interagency Visitor's Center. Note the position of San Francisco. Perhaps the consequences of awarding contracts to the lowest bidder? February 1, 12:00 am EST – Mt Whitney Lottery begins. Set up your free account at recreation.gov. You can choose as many as 15 dates. The date you choose is the date you enter the Whitney Zone / John Muir Wilderness. Everything goes into the hopper and drawn randomly at the end of the lottery so being first doesn’t mean anything. You will owe a $6.00 non-refundable transaction fee at this time. 9:00 pm PST start on January 31 for West Coasters. March 15, 11:59 pm EST – Lottery closes. That would be 8:59 pm Pacific. March 23 – Results are in. Check your account to see your dates. You have from this date until April 1 to look at your dates, see what else might be available, and finalize your permit size. The results are "frozen" until April 1. Costs will be $15.00 per person on the permit. You can alter the size of your original permit downward without penalty but no alterations can be made upward until April 1 and only if there are availabilities. April 1 – All permitting functions thaw out and become operational. Recreation.gov will publish a “calendar” of all remaining availabilities including those generated by permit alterations up to this time. This is also the time you can revise your permit upward if available. Each addition person costs $15.00. Do not accept your date until you know your permit size. Once accepted, any up or down movement in permit size will cost you. April 30 – Last day to accept or decline. You have until 9:00 pm Pacific to hit the “ACCEPT” button. Don't white-knuckle this thing to the very last minute. If the web slows down or you're looking for your credit card when the cutoff point arrives, the system locks and you lose your place. This is also the last day to revise your permit downward without penalty. Make sure you alter the permit size if necessary before accepting. After hitting "ACCEPT," any downward revisions mean forfeiting the dropout's per-person fee. May 1 – All unaccepted dates are released. They become part of the availability calendar. Note: The calendar is “dynamic” i.e. availabilities can go down and up within a 24-hour period. You may find no extra availabilities for your intended date, then manually refreshing the screen ten minutes later shows availabilities added. Check often. 14 days before Whitney Zone entry date -You may receive an email reminding you once again to confirm your date. This should happen whether you went through the lottery or not. Tip: There was a problem with this in the past so check your recreation.gov account two weeks before your date. 2 – 14 days before Whitney Zone entry date - Reconfirm as explained above. Verify your group size or alter it as required. Doing so allows freed-up space to hit the calendar as soon as possible so someone else can use it. The USFS thanks you in advance. Print out the confirmation and bring it with you when you pick up your permit at the Eastern Sierra Interagency Visitors Center on the southern end of Lone Pine. Throughout the process, follow all instructions on any correspondence to the letter. 48 hours to noon the day before Whitney Zone entry date for single-day permits - Pick up your permit. Only the trip leader or alternate leader(s) can pick up. Otherwise, your permit will be reassigned by lottery to a walk-up candidate by 2:00 pm. 48 hours to 10:00 am the day of John Muir Wilderness entry date for overnight permits - Pick up your permit. Only trip leader or alternate leader(s) can pick up. Otherwise, your permit will be reassigned by lottery to a walk-up candidate by 11:00 am. Note: New questions will be added to the list on an ongoing basis. What are the Mount Whitney daily permit quotas? 160 people per day get to summit Mt Whitney by starting at Whitney Portal, the main jump-off point. 60 people get a multi-day permit, 100 people can climb on a single-day permit. Single-day climbs via the Mountaineer's Route are part of the 100 per day quota but multi-day trips via the Mountaineer's Route are not part of the lottery at all. 10 people can climb Mt Whitney via a multi-day trip on the Mountaineer's Route which is part of the normal backcountry permit program. See recreation.gov for details. It's March 5. The lottery started back on February 1. Am I already shut out of my first date choice? Nope. Since the Mount Whitney Lottery went computerized, it does not matter how early or late you are in making your application. Everyone has an equal chance at their first date choice. Nothing is tabulated ahead of time. Once the lottery closes on March 15, the USFS takes a few days to check the integrity of the data, dump any obvious hoarders, bots, and other pests, certifies the results, runs their date assignment program, and sends out congratulatory notices to applicants. What if everyone in my party applies separately? Does that enhance our chances for success? Quite the opposite. According to the USFS, they filter actively now for duplicate or even similar applications for the same dates and alternates, even if each has a different name. They were not clear on whether they allow one to go through or reject all of them entirely. The USFS wants everyone to get at least one shot to climb Mt Whitney. So multiple applications will result in a waste of money and possibly no date at all. What are my odds of landing Labor Day weekend for my summit attempt? About the same as winning Powerball while being bitten by a shark. According to sources within the USFS, about half of the permit applications list Labor Day weekend as either a preferred or alternate date. Tip: Do yourself a favor and climb on a Thursday. It's the least requested day followed by Wednesday, Tuesday, Friday, Monday, Sunday, and Saturday. Weekend days are tough. When I get my acceptance letter, I'm good to go, right? Unfortunately, no. Check the important dates above. You still have to pay $15.00 per person. You have to accept your date. You have to indicate no less than two weeks to two days in advance you and your party still intend to show up. Then you get a confirmation letter good for a permit. Take the confirmation letter to pick up your permit from the Eastern Sierra Interagency Visitors Center as outlined above. Tip: Don't be a sport and pay everyone's fee in your group. They'll be less apt to show up when the time comes. People will move heaven and earth to get their $15.00 worth if they pay themselves. Do I have to go through the permit process to climb Mt Whitney? No. There are two ways to circumvent the process. First, you can log into recreation.gov on April 1 and start watching the rejected dates come back. If someone you know has space on a permit where someone dropped out, you can latch on with them. By May 1, all unaccepted dates are released. Some availabilities will trickle in after that if people are nice enough to give up slots ahead of time that won't be used. Tip: Check out the exclusive USFS study documents below regarding early cancellation numbers to get a feel for when they might occur. Regardless, availabilities usually exist in May and October. May and June will usually require an ice ax and crampons because the trail will be covered in snow above about 11,000 feet. Occasionally the road to Whitney Portal will be closed in May due to snow. The road has been closed into June as well. October features very short days and cold nights with a chance of snow every day. If trained and prepared for the conditions, these are the times to climb in some solitude. The second non-lottery scenario is cooling your heels at the Eastern Sierra Interagency Visitors Center either the day before you want to make your summit bid (single day trip) or the day of entry into the John Muir Wilderness adjacent to the Mt Whitney Zone (multi-day trip). Unclaimed permits get released to the public so it's possible to do an impromptu trip with a bit of luck. situation on top of the highest point for 1,630 miles. To climb Mt Whitney from the traditional eastern approaches, one must submit oneself to that little piece of paradise we like to call the Mount Whitney Lottery. For most people wishing to climb the most typical routes, the lottery is the surest bet to having a permit reserved for their party. The Lottery was created a while back as a fair method for limiting the amount of environmental damage caused by the mostly well-meaning hoards unwittingly loving the place to death. The campsites were in danger of becoming high altitude cesspools, the marmot population exploded, and some marmots themselves actually exploded after gorging on junk food stolen from unsuspecting backpackers. Bear can requirements helped control the marmots (not to mention the bears) but something had to be done about spreading out the folks who wished to climb. Before the lottery, 90 percent of the climbers showed up on weekends. It was a bit of a madhouse. A very trashy madhouse at that. So the lottery not only limits use, it spreads the usage out evenly across the whole week. All Mount Whitney climbing reservations get handled at recreation.gov. One can also use this website to reserve a campground at most national parks and forests. The site takes reservations for backcountry permits as well. If you love the outdoors, chances are you already set up your free account. If you don't have one, spend five minutes and you will. Split your screen into two windows and pull up Mt Whitney Quest again so you can click on the above screenshot in one window and get a good look while reading these instructions in the other one. Shown above is the recreation.gov homepage. Once signed in, enter "Mt Whitney" into the white search box. You'll see some pre-selected results drop down from the search box. Choose "Mt Whitney, Inyo National Forest" from the results then select "Permits & Wilderness" from the drop-down "Interested In" menu. Just above the "Check Availability" button in the first result marked "A," find the two links for "DAY USE of Mt Whitney Zone" and "Mt Whitney Trail Overnight Permit." Click the appropriate link. If you're not sure about your trip type, find the blog posts comparing single-day and multi-day trips. One caveat: The lottery is cobbled together from their normal website code which is cobbled together from God knows what. Clicking as directed will get you where you're going. If you stray off the path here, you may be lost forever. If taking a single-day trip, you'll get the result shown above. You multi-day-ers hang on. We'll get to you in a sec. Click on "Mt Whitney Zone - Day Use All Routes"
The two screen shots above are actually the same page. The lower shot is a scroll-down from the upper. Start by using the first two drop-downs and seeing the results as above. Next, add your permit entry date. Note: The date on your permit is the date you plan to enter the Mt Whitney Zone and summit Mt Whitney. Set your permit size. No more than 15 people can be grouped together regardless of the number of permits. Set your exit point as above. Note the box marked "Alternative Choice 1." Fill out an alternative date and finish as with the first box. When done, click on the link below it called, "Add Alternate Choice (You can add up to 15 choices)." Fill in as many choices as you can before you're choiced out. Moving to the lower shot, fill in your trip itinerary using the drop-down box. Indicate "Mt Whitney Trail" (the main route). Choose "North fork of Lone Pine Creek" if taking a one-day trip up and down the Mountaineer's Route. Note: Multi-day trips up the Mountaineers Route are a completely different permit setup. This is for single-day attempts only. Next, indicate your alternate leaders. This is extremely important. If you can't make the trip due to illness or whatever, and you don't appoint alternate leaders, then your permit is dead. Only leaders or alternate leaders can pick up permits from the Eastern Sierra Interagency Visitors Center in Lone Pine. Your final application should look like this. It won't show all your alternate dates. At this point, all you owe is the $6.00 non-refundable application fee. You do not pay $15.00 per person until you accept your date assignments. After clicking on the "Mt Whitney Trail Overnight Permit" link from the search results page, it should look like this. Click on "Mt Whitney Trail JM 35." 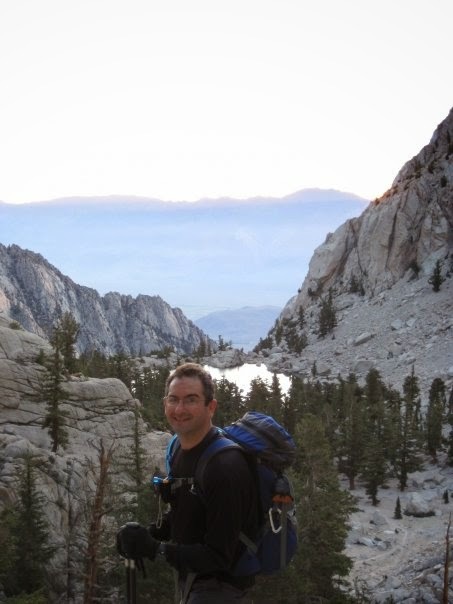 On a multi-day trip, the date listed is the day you plan to enter the John Muir Wilderness (about .9 mile from the trailhead), not the Mount Whitney Zone which starts about a hundred yards up the trail from Lone Pine Lake. Camping at Lone Pine Lake also requires a multi-day permit, hence the difference in boundaries from the single-day permit. The application looks pretty much the same except for the size of the exit-point drop-down menu. Since this is a multi-day trip, the options aren't just limited to different days. You can vary the exit points as well. If you're taking the standard trip in and out, select "Mt Whitney Trail JM35" as both entry and exit points. Also, indicate your exit day (hidden behind the drop-down) With a multi-day permit, you have as many as 13 more days in the Mt Whitney Zone but you must declare your intention to do so. If your multi-day trip begins anywhere other than The Mt Whitney Trail, that's a different permit altogether. You will not be part of the lottery. 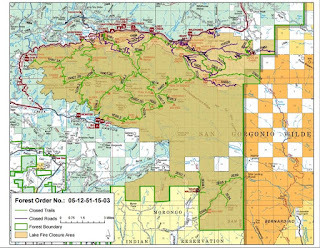 You will be part of the normal backcountry permit system, which allows applications for permits six months to the day in advance of their trips. Planning a south-to north trip on the John Muir Trail? Not only is your backcountry ingress regulated (via the Mount Whitney Lottery), your egress at Yosemite now has a quota as well. Could be a drag if they don't let you stop. Check with the Yosemite authorities for information. Do everything correctly and the above page is your reward. If you had to go back to re-do something, the application fee may be double. Find the link called "Remove Marked Items" in the green bar just below the words "Shopping Cart." Click on it after you put a check mark next to the duplicate entries. Need more info? These fine folks at Inyo National Forest can help. (760) 873-2483. Check out Part II of "Playing the Mount Whitney Lottery" where we discuss strategy, facts figures, and other need-to-knows. Many aspiring Mt Whitney climbers must first climb off the couch or make the transition from light exercise to the type of training necessary for increasing their odds of a successful climb. My own enforced idleness got me thinking about a strategy for helping others in the same boat. 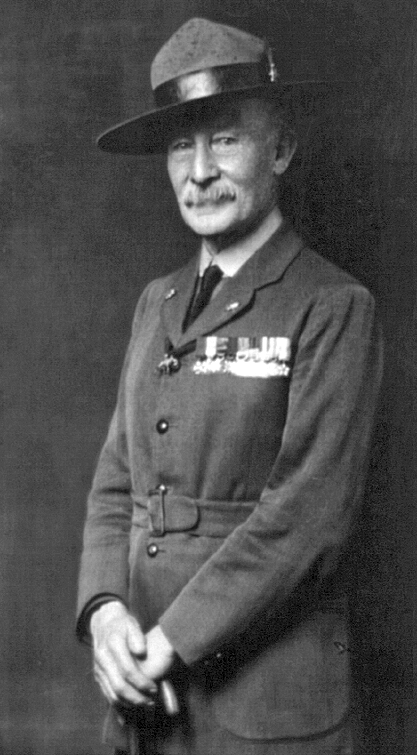 This is where we thank Lord Robert Baden-Powell, father of the Scouting movement. Last April, I started running again after being forced to lay off for 11 months due to a really painful case of plantar fascitis. To prevent injury, I started easily, running a mere one mile a day. After having worked up to two miles, I pulled my calf muscle. Then I pulled it again. Then I pulled it again. "Try fast walking instead of running to rehab the calf," I thought. So I did. Then I pulled a hamstring. While walking. Total humiliation. Despite my 40-plus running years, I learned one cannot jump-start a 58-year-old bod from zero and expect to be back in shape in a week. Actually, I did know that. However, I am still surprised over how long everything takes at this age. It doesn't matter how many years I ran. When I'm forced to lay off and start from scratch it's like I never ran a step in my life. Back in my day, (am I old enough to use that phrase? ), our Scout Handbooks discussed Boy Scout Pace. The idea was to alternate running 50 paces (a pace being two strides) with walking 50 more. Good practitioners could travel 12 minutes a mile or five miles per hour for quite a long time. In a past article I wrote the minimum cardiovascular fitness for a successful, safe Mt Whitney climb was running a minimum of five miles in an hour for the month before the trip. That's not a coincidence. By applying the principle behind Boy Scout Pace, I fiendishly devised a method for returning sedentary bodies back from the dead. The walking interval lowers the running intensity so the body can adapt at its own pace. In practice there are a few different ways to apply the method. After awhile, counting paces drives me nuts. How about counting telephone poles instead? Or light poles? Or trees planted along a street? Or houses? What if you started by running two poles, then walking two? Then three and three? Then four and two? You can use the principle to put together larger and larger blocks of solid running. Boy Scout pace also allows the trainee to stay out longer initially but with less intensity. So that one mile of running turns into a mile of running and a mile of walking broken into smaller parts. Eventually, you will run the whole distance, having strengthened your tendons and ligaments slowly instead of falling into a train-and-injury pattern. I used this method to allow everything to get used to moving in concert again. I weaned myself off the walking parts slowly until I could run three or four miles (5 to 6.6 km) solidly. If I can run that far, I can run six miles (10 km)-plus. Eventually. Thanks, Lord Bobby. Hello to the wife. The opinions expressed herein are those of the author(s) and do not necessarily reflect the positions, beliefs, morals or standards of any of the author's employers, co-workers, family members, friends or affiliated organizations unless otherwise noted. Copyight 2006, 2013 Jerry DeCapua. Powered by Blogger.